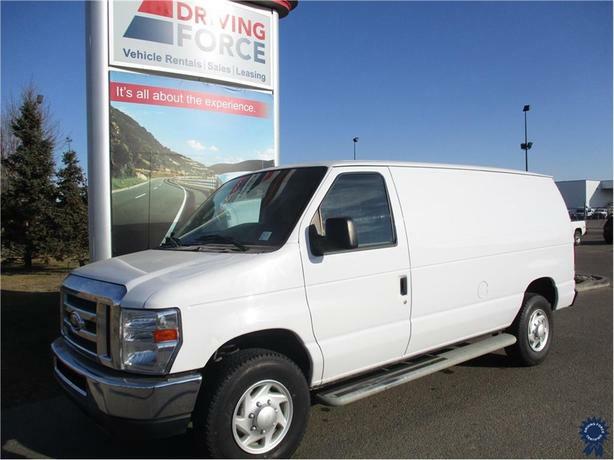 This 2013 Ford E-250 Econoline Commercial Cargo Van is a very rare find in the Alberta used cargo van market, and we know this one will not last long on our lot as it is a huge favorite among commercial contractors. It has a 138-inch wheelbase, 3.73 axle ratio, dual high back bucket seats, air-conditioning, electronic throttle control, 120-amp alternator, twin I-Beam front suspension, semi-float rear suspension, power steering, 16-inch wheels, hinged 60-40 split passenger-side cargo access doors, AM/FM stereo with two speakers, digital clock, and audio input jack, front black vinyl floor covering, tire pressure monitoring system and tilt steering column. The 4.6-litre V8 gas engine provides 225 horsepower at 4,800 RPM and 286 lb-ft of torque at 3,500 RPM. Touch base with us to discuss purchasing or financing options that are right for you and experience the difference you will only find at DRIVING FORCE Vehicle Rentals, Sales and Leasing.